A Lady’s Evening Bag – A keepsake for your dressiest occasions. Pincushions Aplenty – Pincushions take elegant, whimsical, or utilitarian turns. Tatted Treasures – An old technique is in favor again. An Herb-lover’s Kitchen – A recipe for adding flavor and flair to your kitchen. Norwegian Doily – An ethnic masterpiece to crochet. 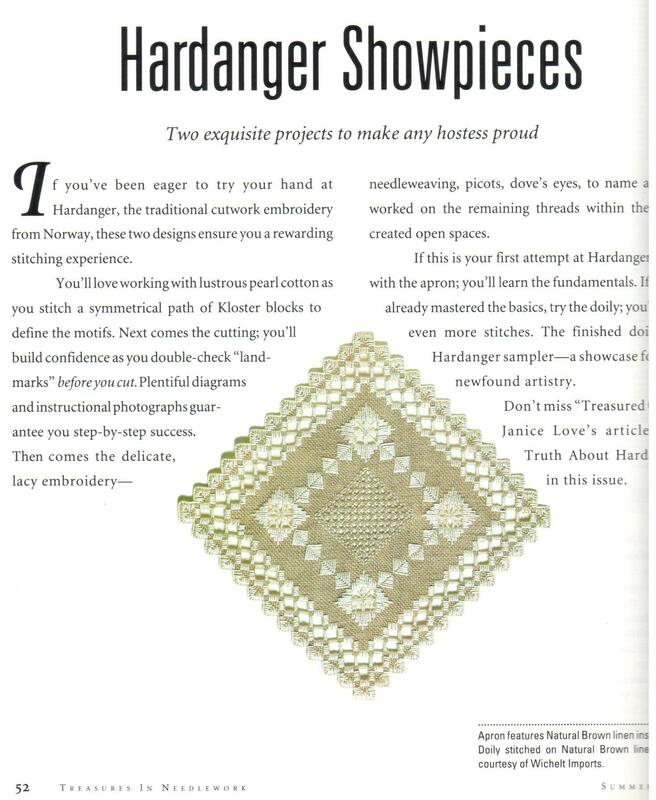 A Hardanger Wedding – Keepsakes for a memorable day. Luxury in Crochet – An heirloom coverlet recalls a gracious era. This Year’s Tree – An enchanting depiction of Christmas in a northern forest. The Bountiful Earth – Cross stitch a rich panorama of gently rolling farmland. An Appliqued Harvest – A lesson from an expert yields an abundance of color and shape. Storybook Animals – Winter Rabbit and Springtime Goose complete a quartet of fanciful animals dressed for the season. The art of illumination inspires a tribute to Christ’s birth. Winter Songbirds – Decorate for Christmas with bright cross-stitched birds. Symbols of Faith – Three gleaming images of Christianity’s most enduring emblem. Storybook Animals -A pair of animated characters – one for summer, one for fall – appeals to the child within us all. Traditional German Towel – Not for the kitchen, this stitched banner will showcase your stitching virtuosity. Dutch Sampler – A “spot” sampler of pictorial motifs reflects the golden age of Dutch culture. Rhapsody in White – Sweet dreams to cross-stitch, crochet, or render in a delicate cutwork. The Romance of Roses – Authentic Berlin wool-work charts lend beauty to contemporary projects, for Christmas and year ’round. Welcome Friends – An entry mirror is perfect for a cross-stitched fruit bowl, a symbol of open-hearted hospitality. Ways to Say “I Love You” – Get set for Valentine’s Day using cross-stitch, crochet, beads, lace and ribbons. Jennifer’s Flowers – “Paint” a cross-stitch masterpiece following these step-by-step lessons. Home Sweet Home – This traditional sampler features specialty stitches and unusual design elements. Tabletop Elegance – Tailored and timeless, a filet-crochet mat is a beautiful addition to your table. Cottage Comforts – Traditional designs and whimsies create a cozy nook. The Pageant Kings – Stitch a stunning representation of the Three wise Men for Christmas.